McCloud River Railroad, McCloud Railway Company; History: 1992-Present. Itel started making movements towards exiting the railroad business as the 1990s dawned. The Ferdinand & Huntingburg Railroad was the first to go, sold in 1990. In 1992 Itel announced that it was going to exit the railroad business as soon as possible and all operations and assets were for sale. The 70,000 railcars were sold to a subsidiary of GE Capital Corp. in June 1992; all U.S. railroad operations were sold by August 1993; the last railcar repair facility was sold in September 1993; and the last owned railroad, Southern Railroad of British Columbia, was sold in early 1994. Itel Rail Corporation ceased all business activities effective 15 July 1994. The McCloud River was in the healthiest shape it had been in since the late 1970s, but the for sale sign placed on the property in late 1991 failed to draw any serious interest and there was some talk that Itel may file to abandon the road if a buyer could not be found. Meanwhile, Pacific Gas & Electric re-entered the scene with plans to lay a second pipeline next to the first one laid through the country in the early 1960s, and, once again, Burney was to be a major construction base. The railroad was to be called upon again to haul pipe into Burney. The flow of pipe started in late March/early April of 1992 and lasted until early July. The pipe was received off of the Southern Pacific at Mount Shasta City and was forwarded to Burney, fifteen cars a day, five days a week. On 1 April 1992 the news broke that the McCloud River Railroad had been sold. The buyer was 4-Rails Inc., created by Jeff Forbis and his family to be used as a vehicle to take possession of the railroad. Approval came quickly, but finalization of the sale was delayed by Itel as they wanted to keep as much revenue from the pipe movements as they could. The actual change of ownership occurred on 1 July 1992. On that date a new company, the McCloud Railway Company, took control of the property. The logo of the new McCloud Railway. The new company was a non-union operation, and overnight train crews were reduced from four to two people. The services of the railroads shops were retained by GE Captial, with boxcars remaining as the primary cars repaired at McCloud. The railroad also continued to store un-needed boxcars on the railroad. Freight traffic remained somewhat strong, and typical operations saw the railroad going to Burney twice a week, to Lookout twice a week, and to Mt. Shasta City once or twice a week. When two trains were on the railroad, additional qualified personnel from the shop or maintenance of way forces were used to fill out the additional train crew. The new railroad was challenged by two major natural disasters in the first year. The first occurred in August of 1992 when the Fountain Fire, a 64,000 acre forest fire, approached Burney rapidly from the west. A shift of winds and quick work with bulldozers managed to save both of the Burney Forest Products and Sierra Pacific Industries sawmill complexes, but several miles of the Sierra branch were affected by the fire. However, only a few ties were burned and one or two wooden trestles in the area were saved. The fire burned through the area on Friday afternoon and evening, but the Sierra branch was repaired in time for a train to operate into the mill on Monday afternoon. The fire was followed by the winter of 1992/1993, which ended up being the most severe winter experienced by the area and the railroad in over 20 years. The railroad was buried in up to 8 feet of snow, and train crews worked every day between 28 December 1992 and 23 January 1993 to keep the railroad open. The situation was complicated when one of the roads three snowplows was wrecked while attempting to open the Burney line. The fall of 1993 saw a major new traffic source develop for the road as the Sierra Pacific mill in Burney started shipping vast quantities of woodchips over the railroad. Service to Burney was increased to five days a week in response to the new traffic, and for a while the carloadings held steady. However, they dropped off substantially as the winter of 1993 gave way to the spring of 1994, and the railroad responded by reducing service to Burney on a once every other business day schedule. Agricultural traffic was handled on a limited basis in this time period as well. Goose Valley Ranch located a short distance northeast of Burney had some wheat fields, and in 1993 and 1994 the railroad hauled a dozen or so carloads of wheat for the ranch each year. The wheat was loaded onto railcars left sitting on the Sierra Branch, as no loading sidings existed in the area. The biggest development in this area was sugar beets. The two major sugar companies operating in California, Spreckles and Holly, had both long depended on sugar beets harvested in Californias various agricultural valleys. In the late 1980s Holly started looking for additional acreage and investigated the Klamath basin. Trials proved to be extremely successful, as Klamath basin beets proved to yield a consistent 18% sugar content while the central California-grown beets showed 13-15% sugar content. Holly was extremely active in the area by 1991, and Spreckles entered the area in 1992. Spreckles soon had contracts signed with growers in the Fall River and Big Valleys and started looking for a way to get beets grown in the area to their refinery located in Woodland, CA. The McCloud Railway offered a reload site and a friendly connection with the Southern Pacific, and agreements were quickly reached. In the fall of 1993 Spreckles started loading 25 cars of beets a day at Burney for delivery to Mt. Shasta City. The 1993 beet rush lasted 10 days and produced 250 carloads. The cars used in the trains were older model four bay open-top hoppers leased from Helm Leasing. Spreckles returned in October of 1994, loading 320 carloads of beets in a two week period. The McCloud would gather the cars at McCloud, forwarding them to the Southern Pacific at Mt. Shasta City in 50-60 car blocks every other day. 1995 saw the last beet trains operate over the road, as only 200 loads were generated in late October/early November. These were turned over to the Southern Pacific in four 50-car long unit trains. By the fall of 1996 the Burney area harvest was down to only 600 acres and all beets harvested were trucked to a reload on the Burlington Northern at Stronghold, Oregon, located southeast ok Klamath Falls. Passenger operations were not initially considered by the new owners of the railroad. However, the company was receptive to suggestions by others wishing to run excursions over the road. The first such event was proposed by Trains Unlimited Tours of Portola, CA. Trains Unlimited specialized in operating special railroad excursions all over the world, and in mid-1993 they advanced a proposal for a unique excursion on the McCloud. The idea was to bring Yreka Westerns steam locomotive #19 (ex-McCloud River #19) from Yreka to McCloud and operate a full weekends worth of excursions using the locomotive. Arrangements were made, and within a short time period the details were worked out and tickets were placed on sale. 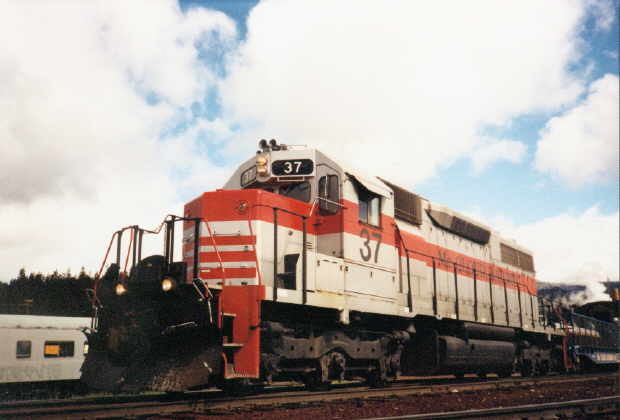 On Saturday 30 April 1994 the #19 made a round trip from McCloud to Burney and return. The train consisted of the #19, a McCloud fire car, four ex-Southern Pacific ballast hoppers, a caboose, a McCloud flatcar outfitted with benches and railings, an articulated passenger coach, McCloud diesel #39, and the roads VIP caboose. The next day the #19 by itself pulled the fire car and the passenger equipment from McCloud to Hambone, where it was overtaken by a regular Lookout-bound freight pulled by the #39. The passenger equipment was added onto the rear of the freight and hauled the rest of the way from Hambone to Lookout and back to McCloud. The #19 left the fire car at Hambone and returned light to McCloud. The event was a complete success, with the trips sold out well in advance. Several hundred railfans and locals showed up to watch the trains run as well. The trip graphically showed the management the potential the railroad still had for passenger excursion revenue. By the summer of 1995 the railroad had two additional passenger flats added onto the roster and was making plans to start a dinner train operation in the fall. The railroad started running sporadic excursions out of McCloud and chartered excursions elsewhere, such as a series of excursions operated out of Burney over the July 4th holiday of 1995. The railroad purchased a total of four heavyweight coaches from a defunct railroad exhibit in the Midwest, and in the fall of 1995 the Shasta Sunset Dinner Train commenced operations out of McCloud. The dinner train proved to be extremely popular, and within a year it was expanded to four cars and three additional heavyweights had been purchased to provide for future expansion. The town of McCloud also underwent a revival during this time, with the downtown area revitalized and numerous new businesses, including several bed & breakfast operations, moving in. By 1996 the road had purchased and received 5 ex- VIA Rail coaches from a private party, and several other miscellaneous coaches were purchased. 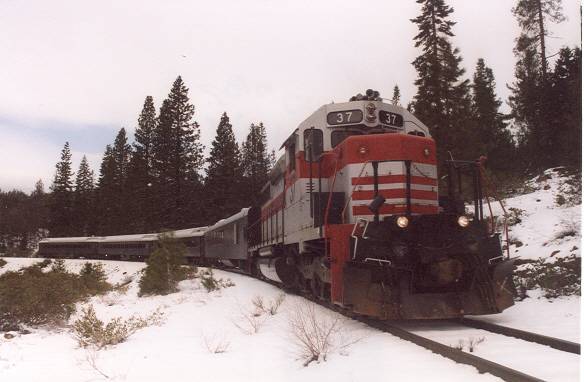 The Shasta Sunset Dinner Train is seen here on 19 April 2003 at Signal Butte shortly after a rare spring snowstorm. Photo by and courtesy of Roger Titus. The big change as 1995 grew to a close was the re-introduction of steam power to the McCloud roster. In late 1995 the railroad was able to secure the title to the #25 back from the Great Western Railroad Museum, and restoration work started a short time later. General operations during this time period saw a train to Burney once every other business day, with a run to Mt. Shasta City on alternate days. Trains to Lookout were run between three and four days a week, depending on paper loads. The time period also saw a change in the name of both of the connecting roads. Burlington Northern merged with the Atchison, Topeka & Santa Fe railroad in 1995 to form BNSF, and a short time later Southern Pacific was sold to Union Pacific, although the deal did not become effective until 1997. The winter of 1996-1997 was another tough one. The area received decent amounts of snowfall, but the spring saw lots of precipitation and lots of flooding. The road found itself washed out in many places along the line, including a few of the places previously washed out in the 1986 storms. Major washouts occurred on all three lines, with the most serious being the complete loss of the Big Canyon fill. The railroad was forced to suspend operations for a month and a half while repairs were made to the track and roadbed. The financial pain inflicted on the railroad was later mollified when the Federal Railroad Administration granted a total of $580,000 in disaster relief money to the railroad in mid-1998. As the passenger operations were taking off, the freight operations received another setback. BNSF received trackage rights directly into Reno as a condition of the Union Pacific-Southern Pacific merger in 1997, and the paper traffic formerly handled through McCloud was quickly diverted to an all-BNSF routing. The sudden loss of this traffic hurt the railroad greatly, but it was still able to hang on with the remaining traffic. The railroad has attempted to find a new use for the now vacant warehouse buildings, with a little success. For a while a paper mill located in the Eureka, CA area was loading paper at the warehouse for outbound shipment, but this did not last long. Dicalite used the warehouse to store bagged product, but didnt ship any of it by rail. Burney Forest Products closed their mill in the early 1990s. The mill remained closed for only a short time, however, as Big Valley Lumber Company quickly leased and re-opened the mill. Big Valley Lumber Company owned a sawmill and co-generation plant in Bieber, CA, in the Big Valley. BVLC already had a re-load established on the Burlington Northern at Nubieber, and all rail-bound lumber from the Burney mill was trucked to the reload to be placed on railcars. The situation changed in late 1999 when, facing a shortage of logs available locally, BVLC arranged to purchase large quantities of raw logs from the Grays Harbor, WA area. BVLC quickly made the necessary arrangements to establish a reload on the McCloud at Burney. Initial plans called for approximately 60 inbound loads of logs and 30-40 outbound loads of lumber per week to be handled on the McCloud through Lookout, and the railroad performed some track work at Burney to get the reload area ready. However, the inbound movement of logs never materialized as all loads were directed instead to the reload in Nubieber. The new reload did generate 15-20 outbound loads of lumber per week. One group of six inbound log loads did make their way to Burney, but all other logs bound for the Burney mill were trucked in from Nubieber. The new traffic provided a much-needed boost to the railroad, but the bankruptcy of Pacific Gas & Electric and their failure to pay electricity providers forced BVLC to shut down all operations in mid-2001. Efforts to get the company re-started were ineffective, and the Big Valley mill was dismantled in late 2001 into early 2002. The Burney mill has since resumed limited operations under the name Shasta Green, but they have not re-established the Burney reload and are not customers of the McCloud Railway. Steam locomotive #25 was restored to service in time to run several excursion over Labor Day weekend of 1997. A second steam locomotive was added early the following year when the nearby Yreka Western Railroad decided to sell their #18 (originally McCloud #18, sold to the Yreka Western in 1956 and stored out-of-service at Yreka since 1964)at auction, and the McCloud was able to out-bid two other bidders to purchase the locomotive. Restoration of the #18 consumed almost three years and $350,000. The locomotives first run took place on Presidents Day weekend in 2001 when it double-headed with the #25 on a special train chartered by the Pacific Locomotive Association. The #18 then replaced the #25 as the working steam locomotive on the road. The McCloud Railway in the late 1990s and early 2000s continued to handle between 1500-2000 loads of freight a year, almost all of it from the Sierra Pacific sawmill in Burney and from Dicalite at Cayton. Typical operations depended on whether or not Sierra Pacific shipped woodchips. If woodchips were moving the road would run a Burney job every other business day to deliver empties and pull loads from both shippers in Burney. If Sierra Pacific was not shipping woodchips, the Burney job would be called twice a week as needed by the shippers. Each train to Burney was followed the next business day by a Yard & Hill job that weighed and sorted the cars brought from Burney the previous day before moving all cars bound for the Union Pacific at Mt. Shasta City across the hill, returning with empties. The Yard & Hill job did any other switching or yard work that needed to be done and ended the day by building the next days train to Burney. Train lengths on the road varied widely, with Burney and Yard & Hill jobs averaging 12-20 cars in length if woodchips are moving and 8-10 cars if they are not. Due to track limitations at the Sierra Pacific mill trains continued to back the 7.8 miles between Berry Wye and the sawmill, and that long reverse move plus the switchback at Signal Butte necessitated the need to use caboose #102 on almost all Burney and Yard & Hill jobs. Operations on the Lookout line dropped to one train a week or less after the loss of the paper traffic, with an average of less than six cars a week moving to this interchange. BNSF finally gave up on this line, and an abandonment application was filed for the Hambone-Lookout trackage in December 2003. A haulage agreement was reached with Union Pacific that sees McCloud-BNSF traffic handled by the Union Pacific between the McCloud at Mt. Shasta City and the BNSF at Klamath Falls, Oregon. The last train to Lookout ran on 16 December 2003. Approval of the application came within a few months, and the grade is now a road after trail use negotiations failed. 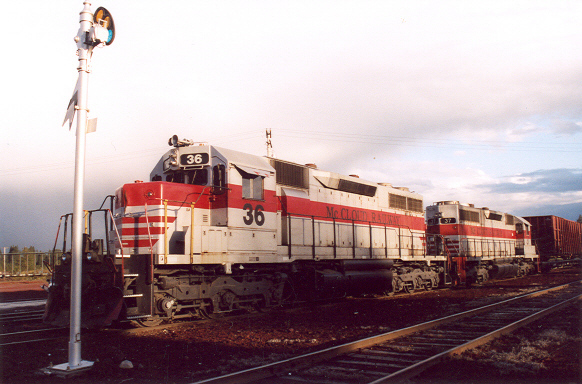 Locomotives #36 and #37 in the McCloud yards on 10 May 2003, awaiting their next assignment. Photo by and courtesy of Roger Titus. The passenger traffic evolved into a year-round operation. The dinner train expanded to six cars in length and ran Saturday nights year round, with Thursday and Friday night runs added during the summer months. An excursion train ran partway between McCloud and Mt. Shasta City on the same days that the dinner train ran. The railroad operated special excursions throughout the year as well, such as Memorial Day and 4th of July steam excursions. The railroad also ran special charter trips for private individuals and groups as needed. The railroad celebrated 100 years of existence in 1997 and 10 years as an independent railroad in 2002. However, by this point financial losses on the freight operations averaged a half million dollars each year, and significantly declining track conditions started causing frequent derailments. The railroad reached the end of its financial rope in 2005, and early July of that year the company filed an application for authority to abandon the entire railroad east of Milepost 3.3, just west of the Pilgrim Creek Road crossing. Several parties requested information on using the abandonment regulations to attempt a forced sale of the line for continued operations, but in the end all those fell through. The McCloud Railway operated its last freights to Burney at the end of June 2006 and commenced salvage operations in August 2008, with the job of removing the rails completed by the end of 2008. Several trail groups became interested in converting the grade to a recreational trail, and their project slowly evolved into the Great Shasta Rail Trail under the umbrella of the Shasta Land Trust. The McCloud Railway Company carried on operations on the McCloud to Mt. Shasta line, deriving almost all of its revenue from the Shasta Sunset Dinner Train. These trains all used diesel power, as the increasingly precarious financial situation forced the railroad to sell both of the steam locomotives. However, the effects of the Great Recession caused ridership to plunge, and the dinner train announced it was ending all operations near the end of 2009. The last dinner train operated in mid-January 2010. The railroad fell silent until October 2011, when the Mike Williams Group purchased the McCloud Railway and Shasta Sunset companies along with the operating assetts, while the Forbis family retained the real estate. The Williams Group has only sporadically operated the railroad since, with the rare movements usually associated with removing scrap or sold railcars off the property. As of this writing the future is an open question for the remaining railroad. The Great Shasta Rail Trail organizations is conducting studies on expanding their trail to the rest of the railroad should it be abandoned in the future. There are few prospects for resuming freight operations, mostly associated with the on-gong redevelopment of the old McCloud sawmill site. The Mt. Shasta region remains a major tourist destination, and some form of tourist railroad is not completely out of the question for as long as the railroad remains intact.